The Cedar Crest Falcons defeated the Hempfield Black Knights 3-1 on the road this afternoon. In doing so, the demonstrated why they are in first place in Section One. Clutch hitting, timely pitching and sterling defensive plays when they needed them. The big hit? A 2-run home run by Jonathon LaBarbera in the top of the 4th inning to put the Falcons up 3-0. The timely pitching? Right hander Dan Mancill. He only struck out 4 batters but he did so in the 5th, 6th and 7th innings when the game was officially on the line. He also held a good hitting Hemfield team to just 4 hits. Sterling defense? From the infield, who made the plays they had to make to shut down two Hempfield threats. 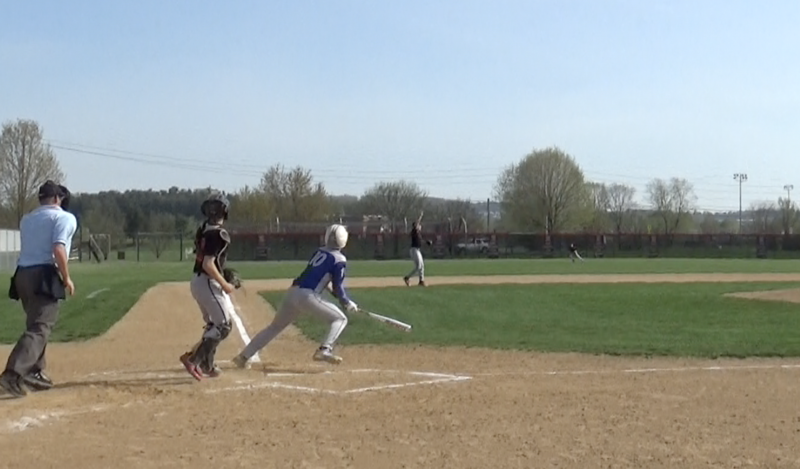 Hempfield scored their only run on a Nick Fiore double in the bottom of the 4th inning. With 4 games left, three against Section One teams, the Falcons (10-3 league, 13-3 overall) hold their destiny in their own hands. They have a one game lead over second place Warwick (9-4 league, 9-5 overall) whom they play May 8th at Warwick. Just reminder in case you don’t know, Derek Fisher, who plays with the Houston Astros, played on this team not all that long ago. The Falcons are back and it’s great to see. They have a rich baseball tradition. They won the L-L League Title in 2011, 1992, 1990 and 1989. The photo below is Jonathan LaBarbera after hitting his home run. Thanks for covering the game. It was a very good game at that! Can’t wait for the interviews. It was a fun game! So proud of all the boys. Let’s Go Falcons!!! Enjoyed your footage. Thanks for the coverage. thanks for taking the time to shoot this amazing group of Young Men. They truly are a team this year. EVeryone works together and they lift each other up. For the seniors, it will be a memorable year, and a great example for our underclassmen. So proud of these boys! Thank you for all the coverage..